Alex Lifeson, OC (born Aleksandar Živojinović; August 27, 1953) is a Canadian musician, best known for his work as the guitarist of the Canadian rock band Rush. In the summer of 1968, Lifeson founded the band that would become Rush with friend and original drummer John Rutsey. He has been an integral member of the three-piece band ever since. For Rush, Lifeson plays electric and acoustic guitars as well as other stringed instruments such as mandola, mandolin, and bouzouki. He also performs backing vocals in live performances, and occasionally plays keyboards and bass pedal synthesizers. During live performances, Lifeson, like the other members of Rush, performs real-time triggering of sampled instruments, concurrently with his guitar playing. The bulk of Lifeson's work in music has been with Rush, although Lifeson has contributed to a body of work outside of the band as well. 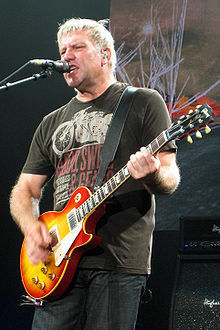 Aside from music, Lifeson is part owner of the Toronto restaurant The Orbit Room, and is a licensed aircraft pilot. Along with his bandmates Geddy Lee and Neil Peart, Lifeson was made an Officer of the Order of Canada on May 9, 1996. The trio was the first rock band to be so honoured, as a group. On May 1, 2007, Rush released Snakes & Arrows, their eighteenth full-length studio album. Lifeson and the band followed up the album with the Snakes & Arrows Tour.